This tea's luscious flavor is reminiscent of the red fruit punch we drank as children - of course, this version is 100% natural. A burst of American cherries is made even livelier with the flavor of blackberry leaves. Delicious hot or iced, this blend takes you to orchards full of ripe, juicy cherries waiting to be made into succulent pies. 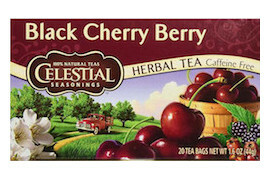 Ingredients: Hibiscus, rosehips, roasted chicory root, blackberry leaves, hawthorn berries, natural black cherry flavor with other natural flavors, chamomile flowers and sweet cherries. Contains soy lecithin.